Bring the clarity, comfort and stable fit* of Biofinity® lenses to astigmatic patients with high refractive errors. Cylinder powers: up to -5.75 — that’s 7 new cylinder powers! Now, for the first time, even your astigmatic patients with high refractive errors can wear silicone hydrogel monthly contact lenses with the proven CooperVision® Biofinity® design. Biofinity® XR toric lenses allow your practice to offer the reliable comfort, clarity and stable fit* of Biofinity® toric lenses to more patients. With Biofinity® XR toric, you’ll be able to fit more patients and expand what your practice has to offer—two inroads to a more profitable business. If you’ve prescribed Biofinity® before, you’ll appreciate that the Biofinity® XR toric fitting approach is consistent with Biofinity® toric lenses. * So there’s no additional learning curve when fitting your high prescription patients. Now more than ever, Biofinity® is the single-brand solution you can trust for all your monthly lens patients. 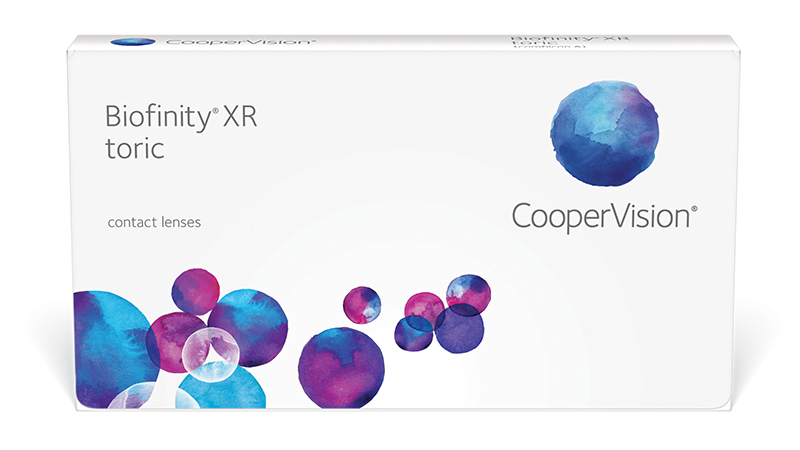 Contact your CooperVision® Territory Manager to learn more about Biofinity® XR toric and the entire Biofinity® family. *Based on a study that compared the made-to-order (MTO) lens design of the Biofinity® XR toric and stock Biofinity® toric lens in the core range over 6 hours of lens wear.